Click on the image to link to the Royal Society website. Our Lady’s have been selected as one of the judging panels for the Young People’s Book Prize. Our Lady’s has been awarded a free set of the shortlisted books which have now been pored over by pupils from different departments, checking them from the perspectives of design, marketing and information books. Groups reviewed every book and calculated an average score for each title. This involved a great deal of discussion and analysis as pupils discovered the value of not judging a book by its cover. As our analysis continued, we also discovered the value of this process for explaining careers connected tot he publishing and creative industries, demonstrating the large numbers involved in getting a book from idea to bookshelf. Our volunteer judging panel will now check over the books in much more detail, preparing questions for authors and illustrators and creating our final submissions. If you would like further information or to volunteer for the judging panel please see Mrs Macfadyen in the Library. S1 worked with their Art and Design teachers and Librarian, Mrs Macfadyen, to create doodles suitable for World Book Day book tokens. As part of the project, we introduced pupils to the illustrator and Children’s Laureate, Chris Riddell, through an Authors Live video, in which he demonstrates his talent and discusses the value of doodling. Mrs Macfadyen also read to each class (including all the voices) while they worked on their own doodles, and the teaching staff shared their own sketchbooks to prove that doodling is going on all the time, and share its value as a way of relaxation. 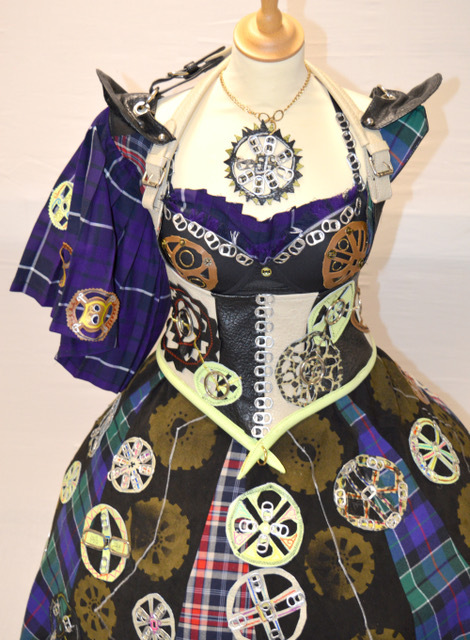 Angela Sewell, Maia Winton and Natalie Marshall have been successful in entering the Junk Kouture competition with their garment “The Flying Scots Girl”. All the garments are made from recycled materials and the entry from OLHS was made from handbags, charity shop clothing, bubble wrap and can ring pulls. There were over 350 entries this year with the top 80 garments making into the Grand Final which will take place on February 9th in the SECC Clyde Auditorium, Glasgow. 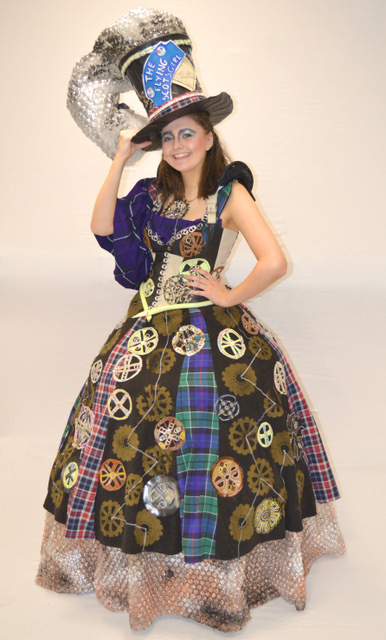 Many congratulations to Angela Sewell whose costume has been chosen to be part of the Grand Final. Supporters can buy tickets to the fashion show and vote for their favourite garment on the Junk Kouture Facebook page. You can now vote once a day for every design. This vote will close at midnight on Friday and it is worth 10% of the overall marks, so please vote for Angela! Maia will model Angela’s design and perform her own choreography on the catwalk on February 9th. Thanks to Ms Steinert for her usual enthusiasm for all things artistic! A number of our S3 pupils were very excited to be involved in a BBC filming production for the BBC Scotland Learning Twitter account which formed part of a daily video advent calendar called Labvent. Pupils created four videos featured across Advent. Art classes learned some of the techniques used in film and television production, such as sound recording, presenting and animation. Only four schools in Scotland took part so it’s great that our pupils had the chance to be involved with this exciting project. Thanks to Ms Steinert for organising such a fantastic opportunity and for Mrs Sinclair for letting us take part! Three S6 girls from Advanced Higher and Higher Art are attending a fashion taster course at Glasgow Clyde College this week. The girls are seeing the fashion department and learning how to develop their fashion ideas in a free three hour workshop. One of our S6 girls has also attended a fashion taster day at Glasgow Caledonian University and has applied to the Fashion Brand and Retailing college link course starting in August. The Art and Design Department has produced a summer newsletter which is being posted this week to help parental involvement, give some advice about homework and what activities senior phase pupils can work on over the holidays who are studying art and photography. 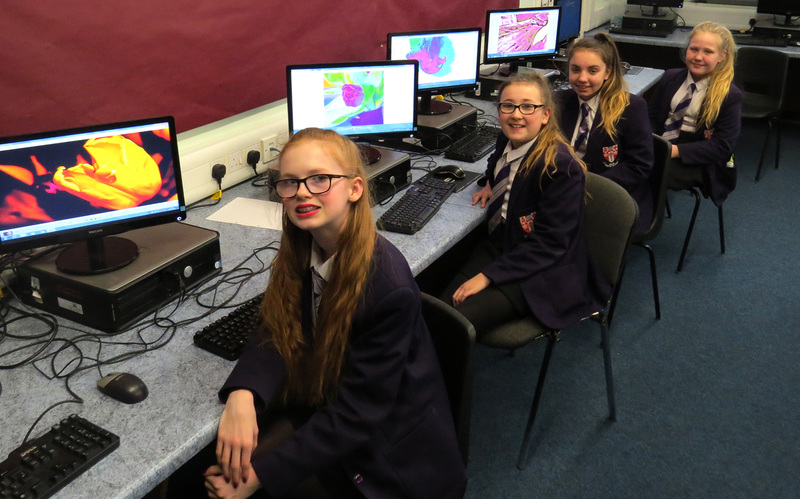 The Art Department of OLHS and Bothwellpark High School have been working on a joint project to decorate the games hall for their end of term assembly in June. The assembly is centred on the theme of friendship, so we decided to use the movie Toy Story and to create large scale murals of Woody, Buzz Lightyear and Jessie. The pupils from Bothwellpark come to the Art Department and have so far helped to paint the images very successfully alongside a group of four S2 pupils from OLHS. The final session will involve adding some 3D collage elements onto the murals which will make them very colourful and a fun resource to hang at the assembly. A few months ago, Our Lady’s entered a competition to design a new logo for NLC’s Child Protection Committee. The competition was open to North Lanarkshire secondary schools who had participated in the Mentors in Violence Prevention Programme. OLHS pupils received excellent feedback on the quality of their submissions and when the Committee met at the end of September, S4 pupil Heather Nugent was chosen as the overall winner. All entrants were invited to the official launch of the new logo in the Millennium Suite at Firpark Football ground for a prize-giving reception, where each entrant was given a certificate and i-Tunes voucher. Heather received her prize from two of the current Motherwell football team along with members of the Child Protection Committee. The Art and Design Department was also delighted to be presented with a cheque for £500. Congratulations to the winners of our 1st year Christmas Card Competition, organised by our Art and Design Department. The card features two artists this year, with Joe Chambers’ work on the front and Wiktoria Gorska’s on the back. This will be the official Our Lady’s High School Christmas card. The Photography Club continued to practise taking macro shots today using the Library’s geology collection. The fossils and rocks were ideal for close analysis, and the pupils loved arranging the materials in different combinations to capture individual details.